Food Review: The Flavors Soar at Dutch & Co. Spinoff Stroops Heroic Dogs | Food and Drink | Style Weekly - Richmond, VA local news, arts, and events. A couple of years ago, the restlessly creative minds behind the award-winning Dutch & Co. started dragging a grill onto their sidewalk. Each Saturday, for an hour, the chefs departed from their haute cuisine menu to produce that simplest and most pedestrian of street fare, the humble hot dog. They called it Back Door Dogs, and it drew Church Hill neighbors and eventually folks from across town desperate to get a spot in line before they sold out. As with everything Dutch and Co. does, though, even a simple meal becomes an opportunity for exploration. Weekly variations of the hot dog theme included a pork sausage topped with blue cheese, apple and caramelized onion or a corn dog with pigskin in the batter. With each hot dog made in-house — stuffed, cured, poached and sometimes smoked — chefs Caleb Shriver and Phil Perrow turned a weekend grilling tradition into a high-minded culinary event. Paired with one of several homemade soda flavors and the classic Dutch dessert, the stroopwafel, it was the best $10 you could spend for lunch in Richmond. But the weekly tradition was relatively short-lived because its popularity proved that the concept could make the leap to a full-time restaurant. And so Stroops Heroic Dogs was born last fall, in a tiny storefront across the street from its parent restaurant, Dutch & Co.
With only eight window-facing bar stools, a booth and small collection of outdoor tables, the takeout vibe of the original Back Door Dogs pop-up is maintained. Simplicity is a theme — white tile, illustrated hot dog art, white counters, minimal design elements. The building is as straightforward as the menu that features only hot dogs, sodas and dessert. The ever-changing seasonal dogs ($6) are the most interesting, and where the innovative spirit behind Stroops shines brightest. 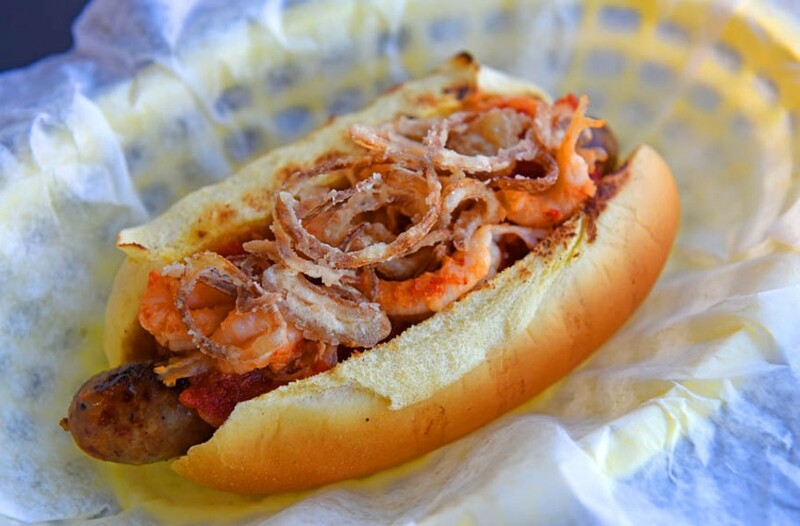 Oddball combinations abound, with, for example, the andouille-date dog — a Creole-style sausage with sweet dates, topped with crawfish, fried shallots for added texture and a smoked tomato sauce. I’ve had crawfish adorn many dishes in New Orleans and elsewhere, but never a hot dog, especially one with dates sweetening the mix. And while I wish the smoked tomato sauce had a little bit more acidic punch to offset the richness of the other ingredients, it’s a minor quibble about an otherwise stellar blend of New Orleans flavors. Similar playfulness can be found in the German-inspired smoked kielbasa dog, featuring pickled mustard seed, apple, spaetzle and cheddar cheese sauce. But the pièce de résistance is the RVA dog, a frankfurter topped with pimento cheese, fried green tomatoes and crab cake. The description alone nearly makes my head explode — how could it work, logistically or flavor-wise? The answer: Little cubes of fried green tomatoes sit next to micro crab cakes, offering a crisp texture to offset the abundant creamy pimento cheese, all atop a hot dog that has just the right amount of snap. The innovative mad scientists at Stroops manage to turn an already an excellent hot dog into a Southern flavor explosion. For the less adventurous, order a simple frankfurter ($3) or bratwurst ($5) with your choice of toppings (50 cents each), such as chili, onion, cheddar cheese, sauerkraut or relish. My 8-year-old loves the corn dog ($3), claiming it’s the best she’d ever had despite not tasting exactly like the state-fair version. My attempts to explain the difference made by minimally processed, quality ingredients seems to fall on deaf ears. The fries ($3/$5) are passable. Given the heights to which everything soars, I hoped for some hand-cut fries from fresh potatoes instead of the thin, fast-food style we are served. Again, a minor complaint about an otherwise excellent meal. To round out your experience, don’t pass up the house-made sodas ($3). With flavors such as ginger beer, orange habanero and grapefruit-basil-elderflower, the drinks are as playful as the rest of the menu — and just as good. For dessert you have only two options: stroopwafel and vanilla ice cream, but they come in a variety of combinations. You can order them separately, together as a stroopwafel ice cream sandwich ($4) or as ice cream with stroopwafel bits added in.